Those who fought in WWI believed they were fighting for noble reasons: for defense against aggression, for the love of one’s country and for glory. Coming into the war they were fueled by the ideals of nationalism, liberalism, democracy and religious freedom. After the Armistice of November 11th 1918, WWI came to be defined by our need to find the meaning for such losses. Exactly what was the significance of the First World War? Was this not the same message John McCrae had given expression to, three and a half years before Armistice in his poem IN FLANDERS FIELDS? 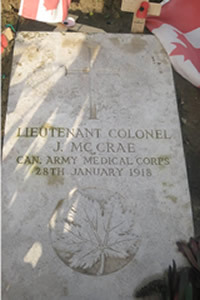 John McCrae struggled to make some sense out of a senseless war. His plea “If ye break faith with us who die…we shall not sleep” was made on behalf of the fallen soldiers but it is one that has been embraced by the generations that followed. In this 90th year since the end of WWI (and since the death of John McCrae) the struggle to find some justification for the loss of so many still remains… not just in the “War to End All Wars” but in every major conflict since WWI. World War I shaped the 20th century. It launched the United States as a world super power and helped commonwealth countries like Canada, Australia and New Zealand find a sense of National Identity. WWI fueled the Russian Revolution and her ascent as the world’s first communist state. The First World War helped occupied countries like Poland, Yugoslavia and Hungary to gain their independence but it also set the stage for World War II only a couple decades later. Yet, WWI began almost by accident. There were three great European powers at the start of the 20th century; The Austro-Hungarian, the Russians and the Ottoman Empire. On June 28th, 1914 in Sarajevo, Serbian Gavrilo Princip, in an act of terrorism, assassinated the heir apparent of the Austro-Hungarian Empire, Archduke Franz Ferdinand. The Austro-Hungarian Empire contained up to ten different nationalities and kept the peace on the western borders. It was ruled by Franz Ferdinand’s uncle, Franz Joseph who had been in power for 66 years. Serbia had set itself up as an independent state by 1914 and viewed Franz Joseph and the Austro-Hungarian Empire, as the oppressive, undemocratic enemy. Serbia hoped to somehow break up the Austro-Hungarian Empire and opposed any kind of friendship. Unlike his uncle, Franz Ferdinand believed in political reform. As the Emperor-in-waiting, his ideas were radical. He believed that after decades of oppressive ruling, the existing political system was one that simply could not last. He wanted to avoid war with Serbia and felt that minorities within the empire would look to other countries for help if they didn’t have the power to govern themselves within the empire. His vision was to create a new empire called the “United States of Great Austria,” in hopes of developing a peaceful co-existence with Serbia. However, Archduke Franz Ferdinand’s decision to visit Sarajevo on June 28th 1914 was ill-conceived in that this was Serbian National Day. Austria-Hungary viewed the assassination as Serbia’s declaration of war against Austria-Hungary, achieving the exact opposite of what Franz Ferdinand had hoped for. Serbia’s great ally was Russia. The Austro-Hungarian ally was Germany. In its decision to back Austria-Hungary, Germany failed to consider the consequences and neglected to find out exactly what Austria-Hungary was planning. Germany felt that Russian would stay out of the conflict in order to avoid internal revolution. The German Kaiser was so confident that Russia would not want to go to war that he immediately left for vacation. The powers of Europe were divided into two main divisions with Germany, Austria-Hungary and Italy comprising one camp and France and Russian making up the other. If Germany backed Austria-Hungary against Serbia and the Russians backed Serbia, then Germany would be forced to go to war against Russia and Russia’s ally, France. This is exactly what happened. Britain had initially been asked by Russia to back Russia and France however Britain’s decision to enter the war was more out of protecting Britain’s global trade and security interests. Britain’s empire also extended into colonies in South Africa and India but Britain was not powerful enough to defend her vast empire without the help of France and Russia. In Europe the neutral countries of Belgium, Poland, Ukraine, Lithuania and Croatia were caught in the middle. In Belgium alone over 11,000,000 people lived under German occupation. Throughout the first three years of the war the United States remained neutral even though German submarines had sunk the civilian cruise liner, the Lusitania on May 7th 1915 and bombed the munitions storage docks in New York harbor shortly thereafter. Throughout the war the United States was supplying munitions and supplies to both the Allies and the Central Powers. In essence, the war was excellent for the American economy. The U.S. joined the Allies on April 6th 1917 only after discovering from British Intelligence that Germany had been secretly encouraging Mexico to declare war on the United States. Other than Austria-Hungary’s offence against Serbia, the other countries involved in World War One were not fighting an offensive war. Most were convinced that they were fighting a defensive war, one that was forced on them by someone else. WWI was a global war that reached beyond the countries of Europe into the Balkans and South Africa. This was a war fought in trenches, in deserts, in mountains, at sea and by air. The vast distances and in many cases the difficult terrain created great challenges to both sides in terms of effective communication, transporting supplies and troops and simply protecting their interests. On the Western Front in France and Belgium, both sides created a series of primitive tunnels that extended for miles underground. Tunnels were used for communications, headquarters, intelligence, dressing posts, etc. In December of 1914 soldiers from both sides put down their weapons and met peacefully between the trenches in “no man’s land,” in a Christmas truce. German and Allied soldiers buried their dead, then shared cigarettes, stories and photos of loved ones. They played soccer, sang Christmas songs and even exchanged gifts until they were forced to return to their trenches by commanding officers. The poem IN FLANDERS FIELDS was composed at the battlefront on May 3, 1915 during the second battle of Ypres by Lieutenant Colonel John McCrae, a field surgeon with the Canadian Army Medical Corps. Within months of its first publication in Punch Magazine (December of 1915) IN FLANDERS FIELDS became the most popular poem of the First World War. It is credited as the inspiration behind adopting the red poppy as a symbol of Remembrance and passages were used to further the war efforts, assisting in the sale of over $400,000,000 in war bonds. In all there were over 50 different cultures involved in the war. Britain and France deployed troops from every continent and mobilized their colonial empires for the war efforts. The French deployed African soldiers from West and North Africa. Britain mobilized South African troops and soldiers from their colonies in India. The Canadian army included Eskimo and Aboriginal soldiers and New Zealand’s army included the indigenous people of the Maori. There were also soldiers from Australia, Pakistan, Spain, Algiers, Scotland and Ireland. Behind the war was an unprecedented workforce of numerous ethnic origins including people from Egypt, Fiji, Vietnam, China and Madagascar. The largest ethnic group, the Chinese Labour Corps, remained in France and Belgium as late as 1919 to help bury the dead and clean up the battlefields. Within the first few months of battle in Europe, both sides met with equal opposition, causing both sides to “dig in”, creating a series of trenches that ran nearly 450 miles from the coast of Northern Belgium through Northern France to the border of Switzerland. For the next four years WWI on the Western Front (as this area was named) remained at a virtual stalemate, where very little ground was gained by either side. Parallel trenches ran the full length of the battlefront, separated by only a few hundred yards called “no man’s land”, which was fortified with rolls of barbed wire and heavily shelled throughout the conflict. This was a war without precedent. WWI was the first man-made catastrophe of the 20th century that devastated both sides. There were almost 40 million casualties in total, including nearly ten million military deaths, nearly nine million civilian deaths and just fewer than twenty million military wounded. Britain’s empire was vast and included colonies around the globe including South Africa, India, Australia, New Zealand and Canada. The policy of the British was to bury their war dead where they fell, in the land where they had given their lives to defend. 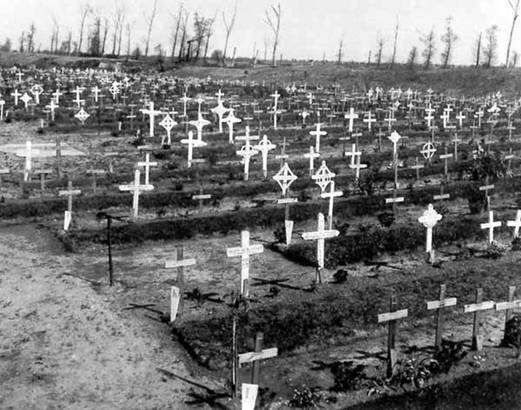 Today the area of the Western Front in France and Belgium contains the graves of hundreds of thousands of WWI soldiers from practically every country involved in the war. Memorials commemorate over 100,000 who went missing in action or could not be identified. One can chart WWI’s progress of devastation and sacrifice simply through the hundreds of cemeteries and memorials that remain. The largest commonwealth cemetery is Tyne Cot Cemetery, which contains nearly 12,000 graves (more than 8000 of those are unidentified) plus a memorial for over 35,000 missing in action. On the memorial headstones of the unknown is the inscription “A SOLDIER OF THE GREAT WAR, KNOWN UNTO GOD”. The largest memorial for the missing is Menin Gate in Ypres, Belgium, commemorating 54,896 WWI soldiers with no known graves. At the outbreak of WWI in August of 1914 many thought it would be a short war, and over by Christmas. Fearing they would “miss out” on teaching the Kaiser a lesson, the majority was eager to enlist. There was widespread enthusiasm in anticipation of the new adventures that lay ahead in Europe. Within a few short months this enthusiasm gave way to the realities of war. Soldiers witnessed the senseless slaughter of hundreds of thousands of their comrades all the while fighting in the most appalling conditions. As the war wore on, the morale of soldiers on both sides deteriorated irrevocably. In the latter stage of the war the biggest threat for both sides came not from their enemies but from their civilians and their alliances. Each side remained in a desperate race between winning the war and collapse on the home front. By the spring of 1918, there was much dissention within the alliances. Austria-Hungary was bankrupt and experiencing widespread famine. Emperor Franz Joseph had died in 1916 and the new ruler, Kaiser Karl opened secret peace negotiations with France in 1917, leaving Germany feeling betrayed. Germany’s other ally was the Ottoman-Turkey, but that empire had been in a string of conflicts for more than seven years. The empire was impoverished, crumbling and desperate, which hindered its ability to remain in the war. By 1918 Russia had all but withdrawn from the war as well, due to the Russian Revolution and eventual civil war. The Russian economy was in ruin and there were great shortages of food and supplies. Russia’s military losses were quite heavy totaling nearly 5,000,000 men. By then, most civilians opposed Russia’s involvement in the war. Soldiers were ill equipped, morale was at its lowest and many soldiers defected or mutinied. The lack of food, morale, supplies and munitions also plagued the Central Powers. This had been a long war with little gains for either side and by 1918 everyone was war-weary. The defeatist attitude of the soldiers and civilians only increased, as did the growing opposition to the war as news of Russia’s revolution reached the Western Front. Strikes and rumors of rebellion were not uncommon. Domestic production of munitions and supplies could barely keep up with the demand as raw materials were becoming increasingly difficult to find. Civilians and soldiers wanted change and a return to peace. The Central Powers were running short on military supplies, and running out of men. Human losses were unprecedented and many new recruits were scarcely trained before being called up for active duty. When Russia pulled out of the war it freed up half a million German soldiers, which temporarily boosted Germany’s confidence in its bid to win the war before the Americans arrived. Germany failed to achieve a decisive victory against the Allies before Americans entered the war. As the Central powers were falling apart the Allies were becoming stronger. The Allies reorganized their command structure and the presence of the Americans gave the Allied troops a huge morale boost. While Germany’s numbers were dwindling, America was adding troops to the Allied forces at a rate of 250,000 a month. By the end of summer in 1918 Germany’s troops were fed up, over exhausted and hungry. Since March of that year Germany had lost almost a million men. Those that remained felt they hadn’t been given adequate supplies or leadership. The final blow came in September of 1918 with the loss of Bulgaria to the Allies. Bulgaria was Germany’s stronghold for the Balkan Front. In early October Germany approached U.S. President Woodrow Wilson requesting that America arbitrate an Armistice between the Central Powers and the Allies. Unfortunately, the war raged on for another six weeks as the politicians argued a peace treaty. The Allies wanted nothing less than to force Germany to surrender unconditionally. Admitting total defeat would make Germany responsible for paying for the costs of war. The closer to Armistice the harder it was to bear the losses, yet some of the fiercest fighting of WWI took place in the last few weeks of the war. While the Armistice conditions were being handed over to the German officials 45 miles outside of Paris, the people of Germany were rebelling against the Kaiser and screaming for democracy. The Kaiser ordered the military to fire on the civilians and when the military refused the Kaiser was forced to abdicate his power and exiled to Holland shortly thereafter. The ceasefire of the First World War took effect on the 11th hour, of the 11th day of the 11th month of 1918. The war was over. Peace and safety was new and a difficult concept for many to grasp. The Treaty of Versailles was signed on June 28th, 1919, precisely 5 years to the day after the assassination of Archduke Franz Ferdinand. The Treaty was meant to end the war, bring peace and to hold Germany responsible for paying for the war. British Foreign Secretary, Lord Curzon felt the the terms fo the Treaty of Versailles were unreasonable and would only set the stage for a Second World War. He declared “this is no peace; this is only a truce for twenty years.” His prediction proved correct to within 45 days!